Researchers at Tokai University report in the journal npj Regenerative Medicine a regenerative medicine approach for treating osteoarthritis of the knee. 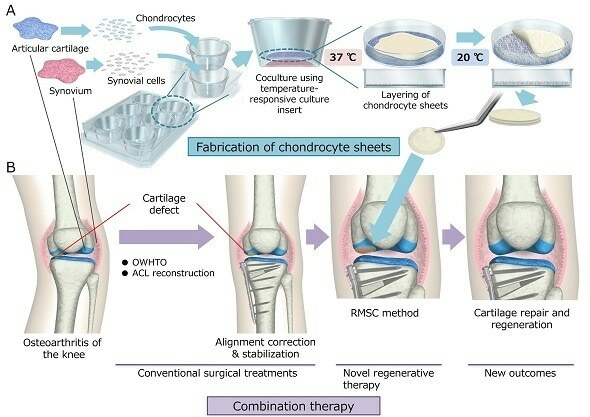 The researchers led by Masato Sato, fabricated chondrocyte sheets—that have regenerative properties—on temperature-responsive culture dishes to treat partial-thickness defects in articular cartilage, tissue that is known to be difficult to regenerate. Chondrocyte cell-sheet preparation (A) and combined surgery/transplantation approach for osteoarthritis of the knee (B). Osteoarthritis (OA) is a joint disease, caused by breakdown of the cartilage in the joint — cartilage is a ‘biological lubricant’ that contains no blood vessels or nerves, but mainly cells known as chondrocytes. OA leads to the gradual loss of a human’s mobility, thus negatively affecting a patient’s quality of life. No cure exists for stopping OA progression. Chondrocyte implantation products are sometimes applied, but for OA of the knee, such implantation approaches are not effective. Now, Masato Sato, professor at the Tokai University School of Medicine, and colleagues have shown that an approach combining conventional surgery and chondrocyte cell-sheet transplantation is a promising therapy for OA of the knee. The researchers had shown earlier that transplantation of chondrocyte sheets in animal models promoted cartilage repair, but such transplantations had never been applied to humans. Sato and colleagues first performed conventional surgery and then chondrocyte sheet-cell transplantation on eight patients with OA of the knee. The transplantations were autologous, meaning that material from the individual was used. This is both disadvantageous (healthy cartilage from another, albeit limited, area in the knee has to be sacrificed) and advantageous (no foreign material enters the body). Because of the need for autologous material, it is unrealistic to perform the procedure more than two times on one and the same patient. The result of the combined approach was assessed by various techniques, including X-ray imaging (before and after the procedure), magnetic-resonance imaging, arthroscopy and photoacoustic measurements of cartilage viscoelasticity. The scientists point out a few limitations of their study. Only eight patients were treated, and although promising outcomes were recorded over the course of a 3-year observation period, longer-term observations are needed to fully assess the proposed combined therapy. Following the favorable results of the clinical trials, the treatment developed by Sato and his group was approved by Japan’s Ministry of Health, Labor and Welfare as an advanced medical treatment for osteoarthritis of the knee. Osteoarthritis (OA), a type of joint disease, results from the breakdown of cartilage, the matrix-type material acting as a lubricant between the bones in a joint. Typical symptoms are joint pain and stiffness. Often, the symptoms develop over several years, and significantly affect daily life as it typically reduces a patient’s mobility. Masato Sato from Tokai University and colleagues have now suggested a treatment for OA of the knee, for which little to no cure exists. The procedure consists of conventional surgery aligning and stabilizing the bones in the joint, and then transplanting sheets of chondrocyte cells into the cartilage defects. (Chondrocytes are the cells found in cartilage.). Initial outcomes of the study have been positive.